A/B testing isn’t just a buzz term that is going to go away with time. A/B testing is your train ticket into understanding your visitor’s behavior and a way to increase your conversion rates. Testing on digital channels is so easy. But still many marketers neglect this topic or deprioritize this topic due to their daily workload. For most businesses, their website conversion rates range from 1 to 3% and only 22% of companies are satisfied with their conversion. The stark truth is that most companies opt out of using A/B test experiments despite the positive results. It’s crazy if you think about, the fact that using the correct targeting and testing methods can increase your conversion rates of up to 300% and marketers just opt out?? Well let’s change that today. It is time to make some resolutions and bring the testing back to life. Using direct channels and getting quality traffic to the website needs to be a priority this year. Here are some recommendations on how to get started.A/B testing is one of the easiest ways to test different versions (A/B or A/B/C …) of copy or creative. You can test and select which one shows the highest customer engagement such as opens, clicks and conversions. It is a way to read warning signs and act accordingly. It is important to know which KPIs are most important in order to measure your email marketing. What should you be testing to improve your email campaign performance? 1. Timing: No…not again on Tuesday morning With A/B testing you can also test the best timing to send out your email campaigns (time of week, day). For this you will need to take a look at the previous messages and analyze them regarding time of open and time of click. That can give you a first hint about which timestamps to test. 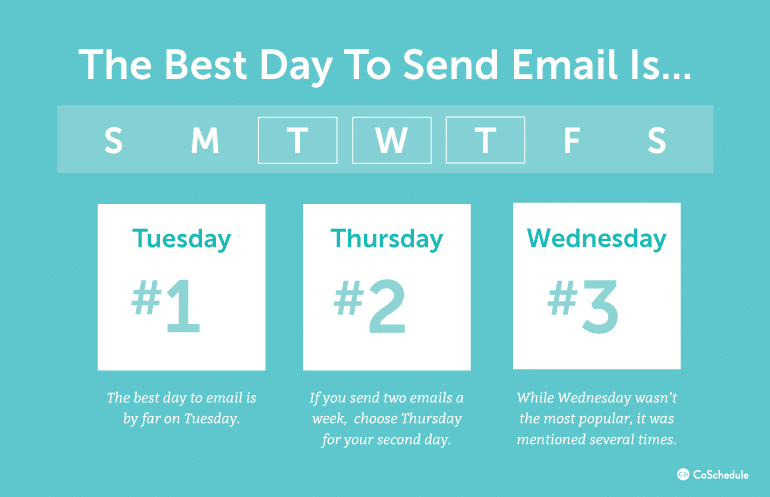 As has been said for a long time already, Tuesday is supposed to be the best day to send your email, as you can also see from the above info graphic in which Coschedule combined 10 studies around the best time to send an email, However, when everyone starts sending on Tuesday, will that stay the same? Each audience is different, as well as each offering and therefore, it is import to keep on testing in order to see which results work best for your audience. Research shows that emails will usually be opened within 60 minutes of receiving them. As a result it is possible to send your emails 30 minutes prior to the peak time. Mobile push messages should follow a similar mantra to email. You should be splitting the target group and sending the same message at different times and then comparing the engagement KPIs. For mobile push the click rate is much higher and more consistent during weekdays with an average of 5.8% compared to the weekend with 3.5% click rates. This is due to the fact that during workdays people are more tuned into their phones and on the weekends they are more distracted. In addition notifications that are sent on Tuesday and Fridays also get more click throughs. Laying your goals- what do you want to learn? Set the testing ground rules- i.e. number of recipients, length of test etc. There are also many free tools to check out your subject lines. Take advantage of the tools at your disposal. Just make sure you are thorough in your intentions and planning methods.You could also test personalization. Leverage your data and include a snippet of a subscriber’s personal information in the subject line. Some recipients may appreciate this kind of individual connection; others, may just feel creeped out. Either way, you won’t know until you take a few calculated risks and compare the responses. For mobile push messages see if you should use rich messages or plain text. Same goes for emails. Should you use a lot of visuals or is it better to send a plain email coming directly from the Sales person? 4. Wording CTA buttons This one is specifically important to make sure your recipients act as you want them to act. For mobile push messages, this is where you get the approval to send push messages so the actual words raise your opt-ins. The same goes for emails, should you rather say “read more” or “download free email article”. If you want them to act as you want then you have to give them a reason to push the button. You also need to be sure that the wording of the button is written with clear intent. The wording should be a direct instruction to your audience that will make them do a certain action. Make sure it is clear and specific and give your audience a reason for completing the action. If they don’t click on the CTA, there’s good chance you did not accomplish what you set out to do and your CTA button was not direct enough, so optimize accordingly. 5. Generic content vs. company related content Especially when it comes to social testing this mainly accomplished by comparing the engagement (likes and comments etc.) over time in order to see what is the most engaging type of content etc. In our Digital Customer Engagement Index, we saw that the more generic and less company-focused the messages were that the brand sent, the higher their followers were. The only other possibility is to send different messages to different groups through Facebook audiences. This way, different segments will see different ads in Facebook and the click behavior on the ads can be measured. Also in emails we advise to test to have own content compared to using generic content. Just be forewarned: Testing too many variables at once only leads to confusion. You can certainly be creative in what you test, but keep it concise, so that at the end of the test you can send the campaign based on what you know works, not what you think might work. Final Thoughts What did I tell you? A/B testing can be wrapped up and executed easily. These are the easiest ways of testing – so be sure to make some time in 2017 to do it regularly as it will improve the success of your digital engagement rates. Happy testing! Get the “Seven Creative Email Marketing Campaign Ideas” to start your successful email marketing campaign today!